There are two evangelists that I highly esteem, one is Reinhard Bonkke and the other is of course, Ed Silvoso. In this book, Silvoso doesn’t present a set of formula or steps to win a city. What he does present are key principles and a biblical framework for any church or leader. This is good as it prevent prayer evangelism to be seen as a programme or job description as a Christian. 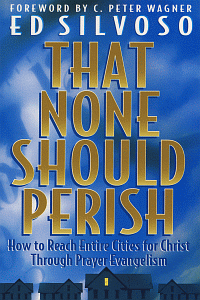 Not wanting churches and leaders to merely see prayer evangelism as part of church growth, Silvoso dedicates a large chunk at the beginning of his book in highlighting the need for unity of the Body of Christ among local congregations of a city. He explains that unity is imperative for any city to be truly transformed. Reading this part did make me realise how much we as believers (including myself) in Singapore fall drastically short in this area. Clearly, there’s a real need for a unified platform for local churches and their members to gather in one collective and concerted effort. Some might argue that there are events staged on a national level. But my take is that there isn’t really one where something really happens. Almost all events have no real sustaining impact to our unity or city. It seems to serve us believers more in creating a false reality that we’re one Body so that we feel less guilty. Therefore, I find Silvoso’s book both timeless and prophetic; a deafening war cry for the Church to rise up and beat in rhythm with the heart beat of God of intercession. And to put aside petty differences for the fulfilling of the bigger picture of the Great Commission as we approach the latter days. Who should read it: For church leaders and missionaries.